I am gradually making each of the items featured in this pattern envelope. The quilted tote bag is view B. The bag has a single small slip-in pocket on the outside plus a large internal slip pocket that is divided into 3 sections. As I have a deal of experience in bag-making thought this would be fairly plain sailing. How wrong I was! To start with the pattern pieces all have to be quilted in a lattice design. That’s the main bag front and back, bottom panel front and back, external pocket, internal pocket, handles and base panel. The only piece NOT quilted is the case for the bag base stiffener panel. Oh well – I set up the walking foot and quilting guide to 4 cms and got stitching. Having completed the quilting I read on to the next step which was to stitch contrast bias binding on both sides of each of the handles. Another time-consuming job. 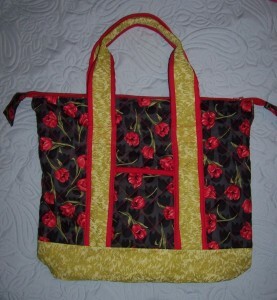 As the bag is not lined this meant frequently changing the top and bottom threads to match the fabric. The pattern instructions also advise binding the seam allowances – but that is definitely a step too far for me so I used my overlocker. However, this also caused a problem in deciding what colour thread to use. I opted for Red but am not happy as this is such a contrast to the Pale Cream fabric that I used for the bag lining. Although I used the length of zip quoted on the pattern envelope and was consistent in using a 5/8 inch seam allowance, the zip did not fit perfectly into the top of the bag. Finally, I unpicked part of the side seams, turned back the seam allowances, top stitched in place and let the zip extend beyond the top of the bag, adding pull tabs to each end of the zip. Again I am not 100% happy but I feel this is the most practical and attractive solution. The finished bag measures approximately 18” wide x 15” deep so is a good size and should prove to be plenty big enough for me to pack all those extras such as my android tablet, kindle e -reader together with chargers and some handicraft project for my upcoming stay in hospital.